A SysCAD project is built using Graphics Windows. 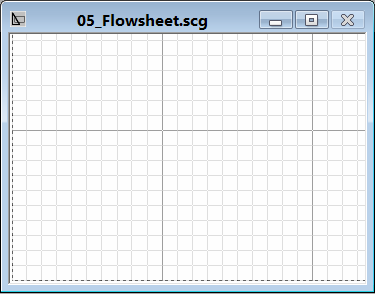 A project may contain any number of Graphics Windows and each Graphics Window can represent a process flow diagram, and is saved with the extension scg. 04 Counter Current Washing Circuit, etc. In addition, in SysCAD 9.3 Build 137 and later versions, the user may group Graphics Windows together in Areas. This allows the user to easily activate and deactivate areas of the project and in the Explorer Window the user may expand and collapse the areas, making it easier to navigate around large projects that have many flowsheets. 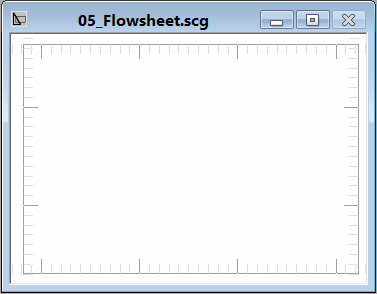 Flowsheets are built either by drawing with the SysCAD drawing tool or imported from a DXF drawing. 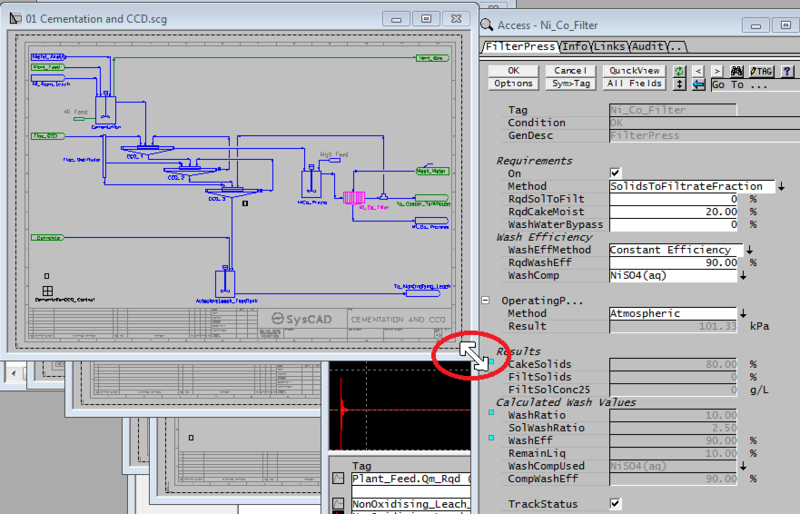 When drawing with the SysCAD drawing tool, the unit operations are inserted into the Graphics Window using the Insert Unit command. Links are used to join the units together via the Insert Link command. When a unit or link is inserted, the unit's mathematical model is added to the solver network, and a graphical representation of the unit is inserted on the Graphics Window. 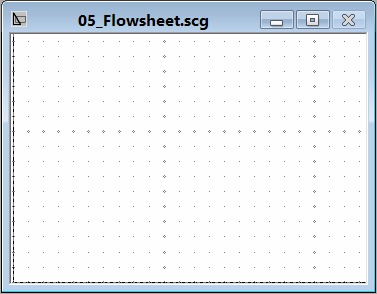 See Graphics Commands for the various drawing commands. When importing from a DXF drawing, the unit operations are constructed using the Construct Unit and Construct Link commands. When a unit / link is constructed, the unit's mathematical model is attached to some selected graphics from the DXF drawing. 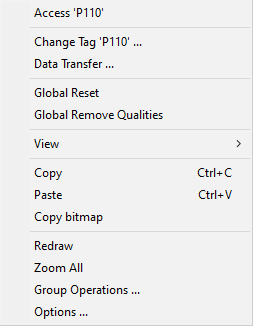 A tag name cannot contain spaces and other illegal characters - the tag naming convention options can be found at Project Settings - Graphics and Tags. You can locate the unit on a Graphics Window using the Find Tag command. The Access Window for the selected unit can also be opened. You can change the tag name at anytime, (see Change Tag). Make sure the Graphics radio button is selected. To close a graphics window the user must use the Graphics menu. Please see Delete/Close Active Graphic in SysCAD 137. To close a graphics window the user must use the File menu. Please see Delete/Close Active Graphic. Note: Closing a graphics window is normally equivalent to deleting it from the project. The user may change the size of the Graphics window at any stage by positioning the mouse pointer over the corner, or any edge, of the Graphics window, when the pointer changes to a double-headed white arrow (see diagram below). The user then holds down the left mouse button and may drag the corner, or edge, to increase or decrease the window size. We do NOT recommend maximising the Graphics Window, as if you do this, it is not easy to move between windows. 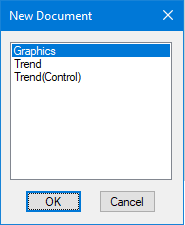 When the window is not maximised, you may move between Graphics windows, the Access window, Trend windows, etc, by simply clicking on the required window. In the diagram above, the user may access any unit and the Access window will be displayed next to the graphics window. To access another unit, the user merely right clicks on the desired unit. If the Graphics window was maximised, the user would right click on a unit and the access window of that unit would also be maximised and therefore to get back to the Graphics window the user would have to click on the 'Cancel' button. This feature is only available in SysCAD 9.2 Build135.13488 or later. User can manually toggle the Grid display on/off by pressing Ctrl+G when on the Graphics Window. User can define the Big Grid Size. This is the size of each grid, in millimeters. The Major Grid is 10x10 of Big Grids. The small Grid is for Insert links and moving objects. They are not show on the Grid display. The big Grid Count is displayed on the Graphics Window Status bar, it updates with the mouse pointer position. When the drawing area is zoomed out sufficiently, only the Major Grid lines are shown. A maximum of 200x200 Big Grid elements are shown. If your drawing covers more than this, then you can change the Big Grid value. The default Big Grid value is 5mm which allows a grid display over a 1m x 1m area (so fully covering an A1 sheet - 841 x 594 mm). The background colour selection is global and user based, once the selection is made, it will apply to all projects. For SysCAD 9.3, See General Options Mouse for more information. For SysCAD 9.2, See General Options Mouse 9.2 for more information. If you right click on the Graphics Window Background, the nearest unit to the click will turn magenta, and various options will appear in a pop up Access Menu, as shown below. The options available will depend on the nearest unit type (in the example below this is a Pump). This list will also be present if you right click on a unit while pressing the Control key. Access Unit Tag - This will open the Access Window for the unit. Start - this will start the pump if it is stopped. Stop - this stops the pump if it is running. Note: Some of these options will only show their effects in Dynamic modes. Change Tag... - You may change the selected unit's Tag name. Data transfer... - This opens the Data Transfer dialog box for the nearest unit operation. Global Reset/Reset All: A Reset will do a complete Reset of this model only. Options available for Probal (Steady State) mode and dynamic mode. Reset Actions - Dynamic Only (Process, Control, Stats, Events/Profiles, Empty, Preset) Please see Action Commands in the Plant Model for descriptions of these functions. Global Remove Qualities/Remove Qualities: This option is used to remove any Qualities inherited in the model. Useful for cleaning up unwanted buildup values. Options available for Probal (Steady State) mode and dynamic mode. Content to Preset: Transfers the current content to the Preset image. This preset image will be used when Preset action is selected. Paste: Activates the Paste Graphics command. Note, clipboard must not be empty, ie, Copy should be used first. Reset: A Reset will do a complete Reset of this model only. Options available for Probal (Steady State) mode and dynamic mode. Remove Qualities: This option is used to remove any Qualities inherited in the model. Useful for cleaning up unwanted buildup values. Options available for Probal (Steady State) mode and dynamic mode. If you hold down the Shift key and left click (Shift + Left click) on a unit in the Graphics Window, and various options will appear in a pop up Unit Access Menu, as shown below. The options available will depend on the Solver mode and the unit type - in the example below this ProBal and a tank. Access Alt Unit Tag - This will open the Access Window for the unit as the 2nd Access Window, or the alternate Access Window. 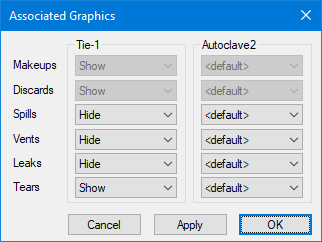 Associated Graphics - This command produces a dialog box which allows the user to show or hide direct links graphics. This is described below. Reset Unit - This command relates to setting the status of the selected unit. 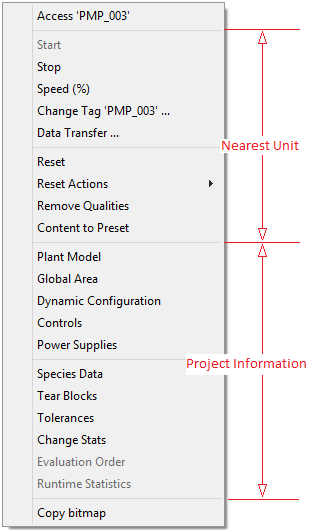 Please see Action Commands in the Plant Model for descriptions of these functions. Copy Audit to Clipboard - this allows the user to copy the mass and energy flows into and out of the unit to the clipboard. This may then be copied into Excel for analysis. This dialog box allows the user to show or hide direct links graphics. The selections on the left will apply to ALL models of the selected type, in this case all units of type Tie-1. 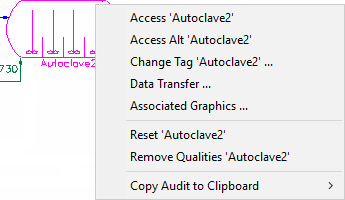 The selections on the right will apply to just this particular unit, in this case the Autoclave2. Hide: the graphics will always be hidden. Show: the graphics will always be shown. In Use: the graphics will be shown if there is any flow through it and hidden when there is no flow through it. Ever Used: the graphics will be shown if there ever was any flow through it. <default>: only available for individual units. This means the rules for the graphics for the individual model will follow the rules for the unit type. Note: Makeup and Discard links will always be shown and there are no other options.